The Veterans Affairs Department suffers from “fundamental management weaknesses and is one of the most challenged in the federal government,” Comptroller General Gene Dodaro told a Senate panel recently. 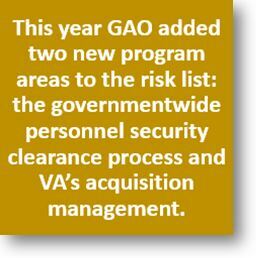 Leadership instability, high-level vacancies and a lack of accountability are all problems at the sprawling, decentralized VA, which appears three times on the newly released biennial list of high-risk programs compiled by the Government Accountability Office (GAO). Just days after the Pentagon released a post-mortem on a fatal ambush of U.S. combat troops in Niger last year, the department’s watchdog criticized U.S. Africa Command for mishandling a contract for conducting emergency evacuation services and airlifting cargo across the continent. Defense Department rules required the command to conduct what is called a Service Requirements Review Board to analyze and verify its requirements before U.S. Transportation Command awarded a $900 million contract for trans-Africa airlift support. The command’s contracting staff “did not take responsibility as the requiring activity” for the contract, with Transportation Command officials assuming that as long as they received funding and a performance work statement, “the requiring activity had validated the requirements,” said the report dated May 8. The Department of Defense (“DoD”) has issued two Class Deviations that provide defense agencies with greater flexibility when procuring in times of crisis. These Class Deviations allow for the use of simplified acquisition procedures and excuse certain procurement obligations when DoD is responding to a cyber-attack or providing relief in support of domestic or international disasters. 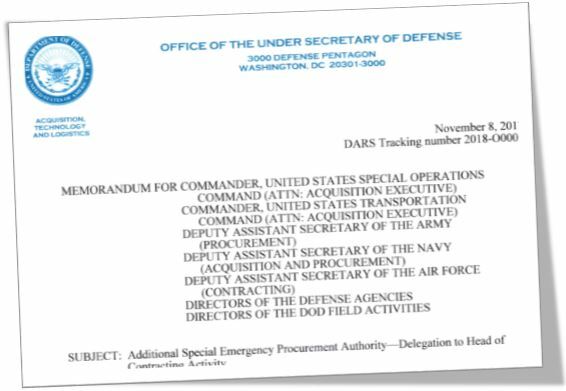 On November 8, 2017, DoD issued Class Deviation 2018-O0001, which expands the types of procurements treated as commercial item acquisitions and exempts acquisitions in support of cyber-attacks, international disaster assistance, and “emergency or major disaster” relief from requirements to (i) comply with item unique identification, (ii) receive two offers, and (iii) limit the use of time and materials contracts. This Class Deviation also delegates authority for determinations relating to these acquisitions from the Secretary of Defense to the various heads of contracting activities within DoD. The Defense Department isn’t built to handle cybersecurity defense well. Its acquisition system is designed to develop and purchase large, expensive weapons systems while holding to the tenets of competition, transparency and integrity. That means it can’t keep up with cybersecurity defense. But taking seven-to-10 years to develop a new fighter jet or weapons system is one thing; taking that long to develop cybersecurity systems is another. It can’t keep up with the speed of attacks, much less the speed with which the threat environment itself evolves. Schoeni said Congress has tried to help by expanding authorities for purchasing cybersecurity technology, including rapid acquisition and special emergency procurement, but neither one does enough.